HOLAAAA!!! I have been busy with my new brand for the past two months and haven't got the time to travel. Now that I have it settled and launched, it's time to take a break! I am not sure how often do you guys watch TV theses days; I watch it pretty often with my parents. By now the Expedia.com.sg commercial on TV has already gotten into my head, "book your flights and hotels together and save up to 31%! Shhhhh...don't tell anyone". I'm pretty sure at least a handful of you have seen the commercial that I am talking about right? Great news for me, I now get to work with Expedia.com.sg to bring you guys some really exciting travel content and fun! Booking my trip with Expedia.com.sg has been such a smooth and easy process. What I really like about it is, I am able to to book flights and accommodations together! And there are many other options like car rental; things to do etc. that are available on Expedia.com.sg. Pretty much a on-stop travel-booking site! I have done my bookings and guess where I am heading??? I have a friend who resides there and I can't wait to explore Chiang Mai with a Local. Live updates will be available on my Instagram @valerie_wang @expediasg. Before I hop onto the plane in less than 2 hrs time, here's some tips for you to save even more with your bookings! 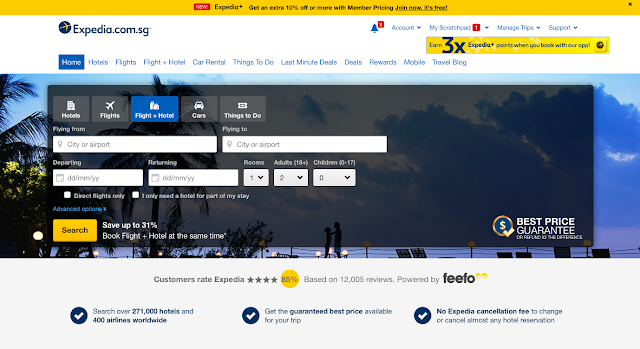 Search for hotels and flights on Expedia.com.sg and there is a chance you may get free flights or hotel nights! This will be featured as "SMART DEAL" if you book them together. Quite a steal in my opinion!